Born in 1980 in Athens and raised in the Aegean island of Icaria. Studied physics (BSc) and computational physics (MSc) at Aristotle University of Thessaloniki. Subsequently moved to Athens and Berlin as a PhD scholar. Obtained PhD in Applied Mathematics, for studies of synchronization in complex systems. Started postdoctoral research at Fritz Haber Institute of the Max Planck Society in Berlin and continue at University of Barcelona. Worked as researcher in the Computational Neuroscience group at the University Pompeu Fabra in Barcelona and recently granted the “MOVE-IN Louvain” international fellowship for performing research in complex systems in naXys, Belgium. 2011: PhD in Applied Mathematics, National Center for Scientific Research “Demokritos”, Athens and Aristotle University, Thessaloniki..
2006: MSc in Computational Physics, Aristotle University, Thessaloniki. 2004: BSc in Physics, Aristotle University, Thessaloniki. Languages: Greek, English, Spanish, German (B1). University of Namur, Department of Mathematics, Namur, Belgium. Complex Systems Group (Prof. Timoteo Carletti). Pompeu Fabra University, Barcelona, Spain. 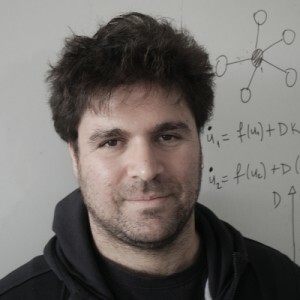 Computational Neuroscience Group (Prof. Gustavo Deco). University of Barcelona, Department of Condensed Matter Physics, Barcelona, Spain. Complex Lab Barcelona (Prof. Albert Díaz-Guilera). Fritz Haber Institute of the Max Planck Society, Department of Physical Chemistry, Berlin, Germany. Complex Systems Group (Prof. Alexander S. Mikhailov). Humboldt University of Berlin, Department of Physics, Berlin, Germany. National Research Center “Demokritos”, Institute of Physical Chemistry, Athens, Greece. “MOVE-IN Louvain” Incoming post-doc Fellowship, co-funded by the Marie Curie Actions of the European Commission for studying “Self-organization and self-adaptation of complex networks”. naXys, Namur Center for Complex Systems, University of Namur, Department of Mathematics. Distinction of every class completed, Department of Physics, Aristotle University of Thessaloniki, Greece.